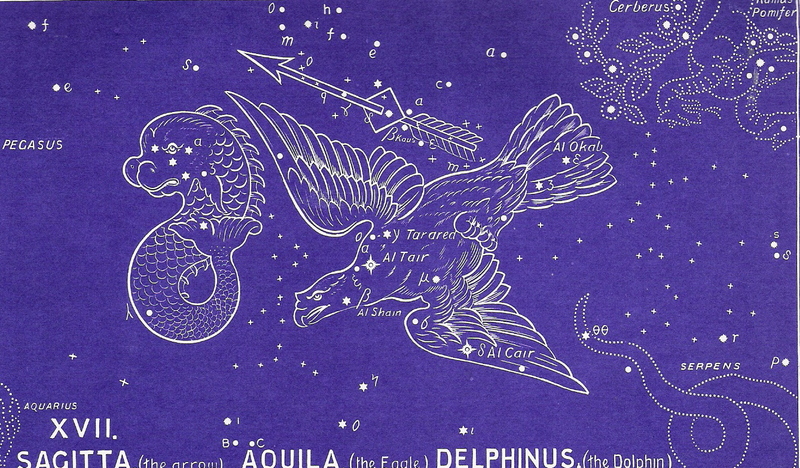 Delphinus is the final decan (or constellation) associated with Capricornus. Remember that the three decans are so closely associated that we are studying them together. If you haven’t yet read the pages for Sagitta and Aquilla, please do that now. Also, for a quick review — remember that we are talking now about the blessings of salvation that we are given when we identify ourselves with Christ. With Capricornus, we entered into “Book 2″ of this star study. Book One was the star revelation of Christ’s death, burial and resurrection — and in a sense, Book 2 is about our own death, burial, and resurrection in Christ. Obviously, not a literal death — but a spiritual one. With the three decans of Capricornus, we see a picture of this. Sagitta is the arrow sent forth by God to kill our old nature, which is represented by Aquilla, the eagle falling down in death. Now, we see Delphinus, which represents our resurrection of sorts. In Greek mythology (which, remember, was invented thousands of years after these star charts were penned), this sign is representative of Arion, who was famous for his poetry. Arion was on his way home aboard a ship when he learned that the sailors had plotted to kill him. He began singing so beautifully that a school of dolphins came to the ship and allowed him to jump onto the back of them, thus cheating death. The sailors were executed upon their arrival. Of course, this sign really does represent someone who cheated death — Jesus Christ — and by our co-inheritance with Him, we also cheat death! Delphinus is a dolphin, which are creatures IN the sea — and yet not OF it. A dolphin must come up for air! Just as Jesus Christ was IN this world but not OF it, we also are instructed to do the same. The small group of constellations associated with Capricornus represents the greatest GOOD NEWS ever told — the death, burial, and resurrection of Jess Christ. We are assured that all the blessings secured by Christ are truly ours because He has insured them to us by the greatest of all demonstrable proofs — His own resurrection. That resurrection power is ours to be claimed and trusted every day. To continue in the correct order of the ancient star chart, please select Aquarius next.